There are some babies who just won’t keep a bib on. My little guy was one of those! He needed something that he couldn’t pull off. This is how the Stay-On Bib was born. It has elastic around the arms so it’s harder to pull off, but also no flappy bit to get in the way of crawling hands! 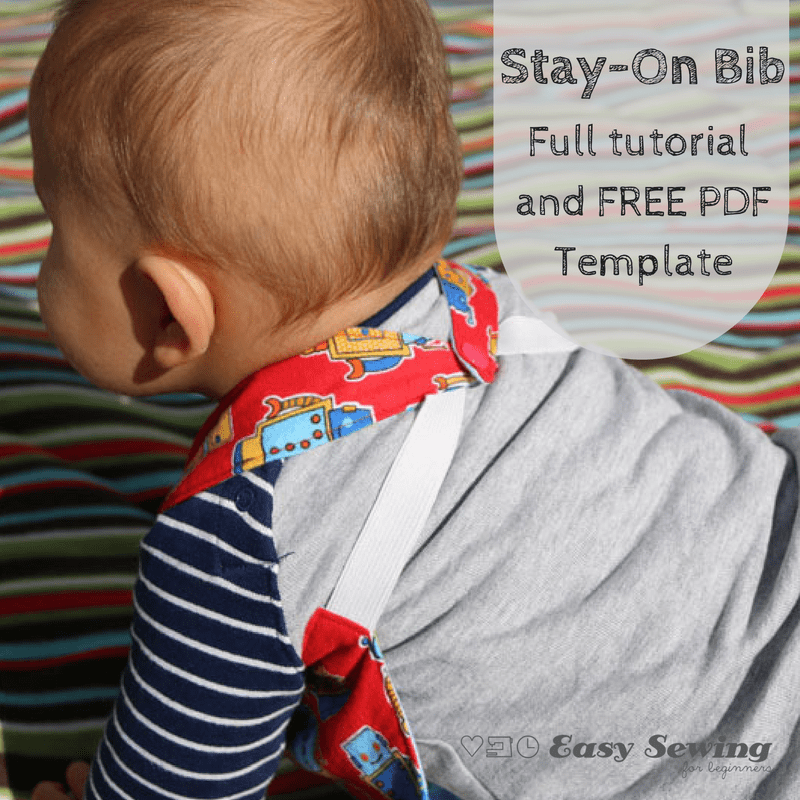 The Stay-On Bib is perfect for a beginning sewer and this tutorial has full video instructions so you can watch it being made step by step. This project contains affiliate links (meaning I receive a small commission if you make a purchase through my link and it doesn’t cost you any extra) and I truly thank you if you choose to make a purchase through any of them ? Find the instructions and 4 different size templates in the THANKYOU Edition PDF found in the ESFB Shop! Ad free and convenient! Print out the first page of the pattern pages. N.B. Ensure your printer settings are set to print at a scale of 100% or ‘Actual Size’ . 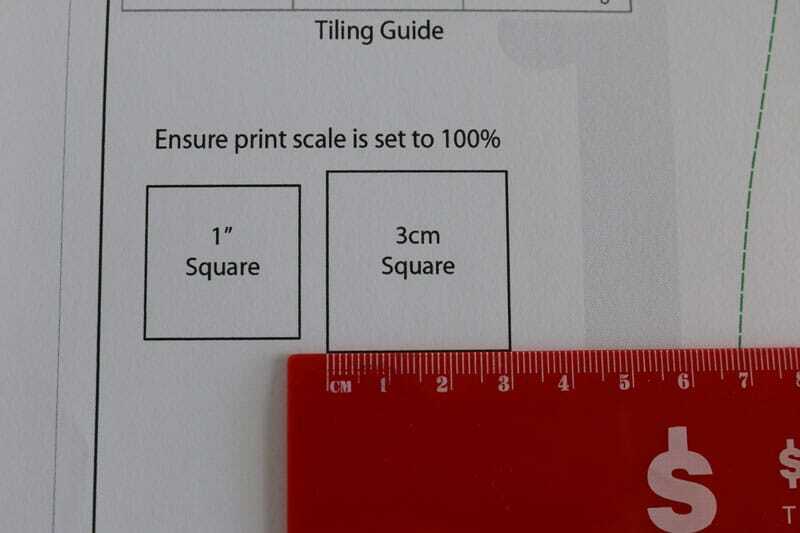 Measure the test square to ensure the printer settings are correct. 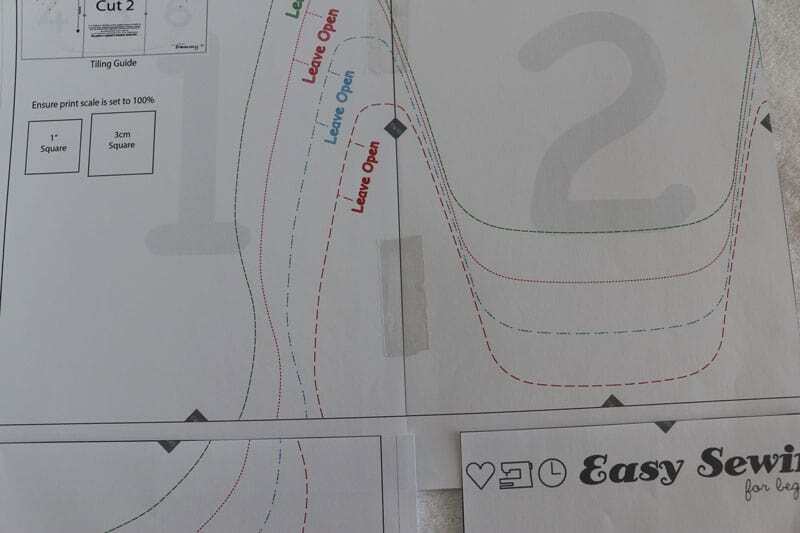 Print out the rest of the pattern pages once your test square has measured accurately. Trim and tape the pattern pieces together. Use the tiling guide, if necessary. 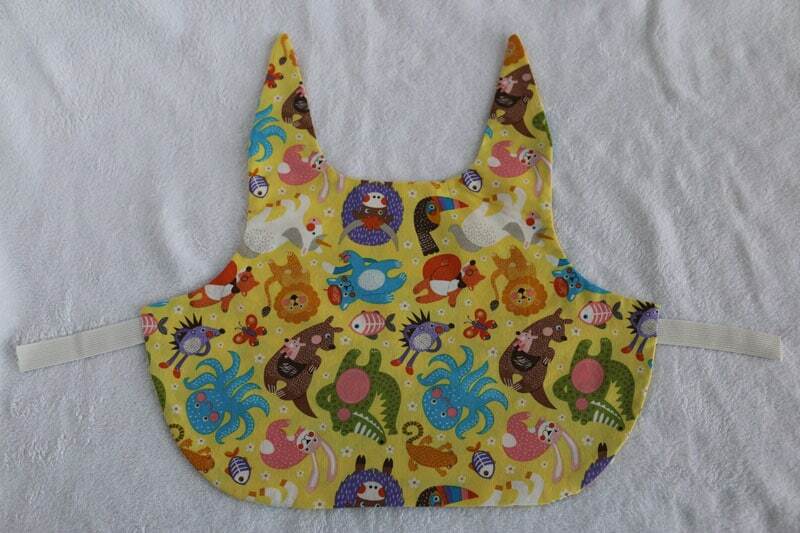 Cut out the free medium size paper template for the Reversible Stay-On Bib. Alternatively, you can tape the pattern together and trace the required size pattern and markings onto tracing paper and cut out. 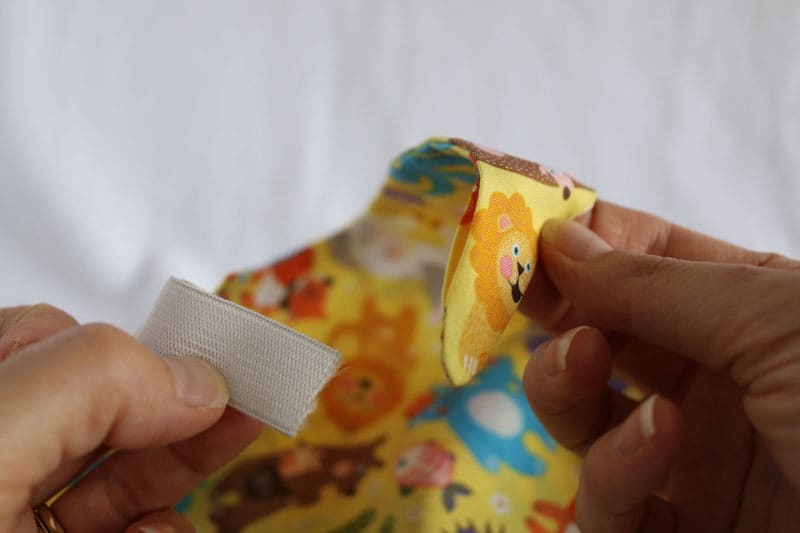 Fold the fabric in half with the right sides (or printed/patterned side) of the fabric together. Pin the paper pattern in place. Tip: I like to line up the selvage edges together. Then I know I have the grain line running the right way, as the grain line always runs parallel to the selvage edge. Cut around the paper pattern. 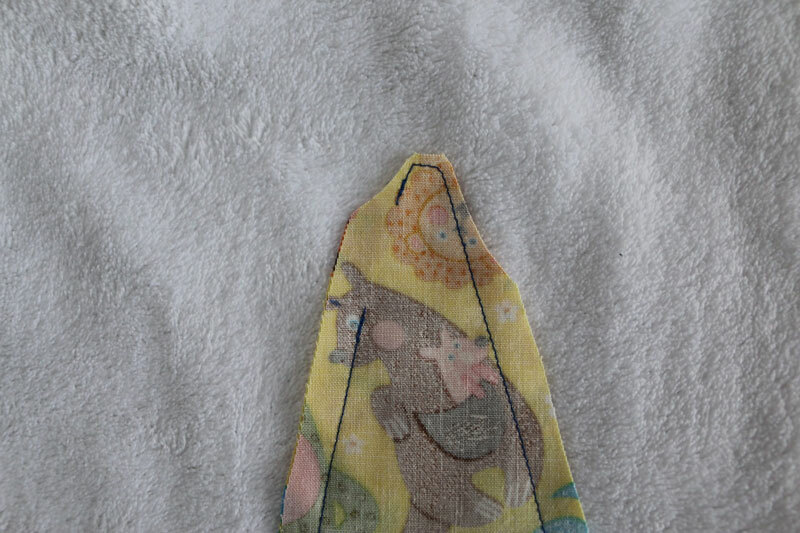 Transfer the ‘leave open’ markings to the wrong side of the top piece of fabric. 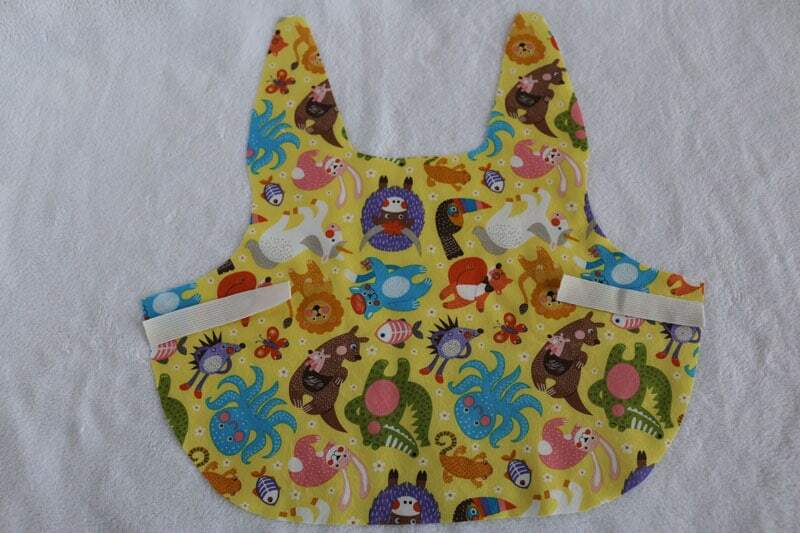 You should now have 2 sides of the bib with right sides (or printed/patterned side) together ready for the next step. 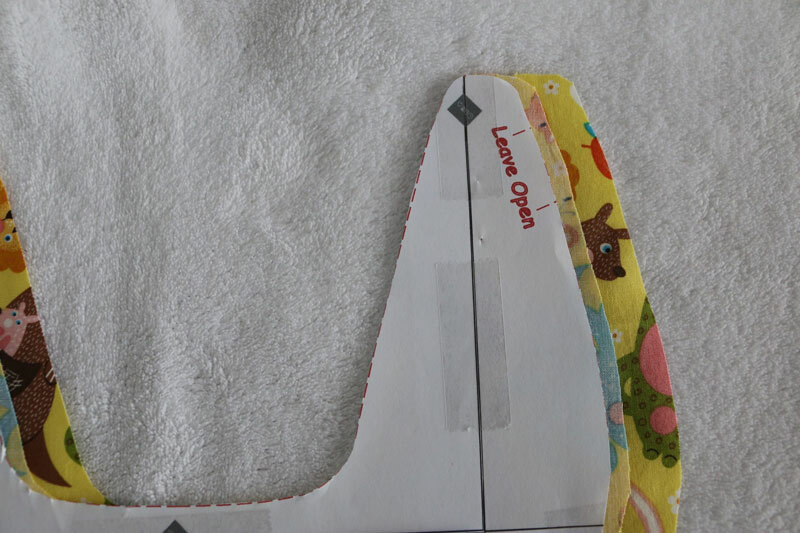 Take your elastic strips and place onto the right side of the bottom piece of fabric where you see the ‘X’ markings. Put the other piece of fabric back on top and pin elastic in place. 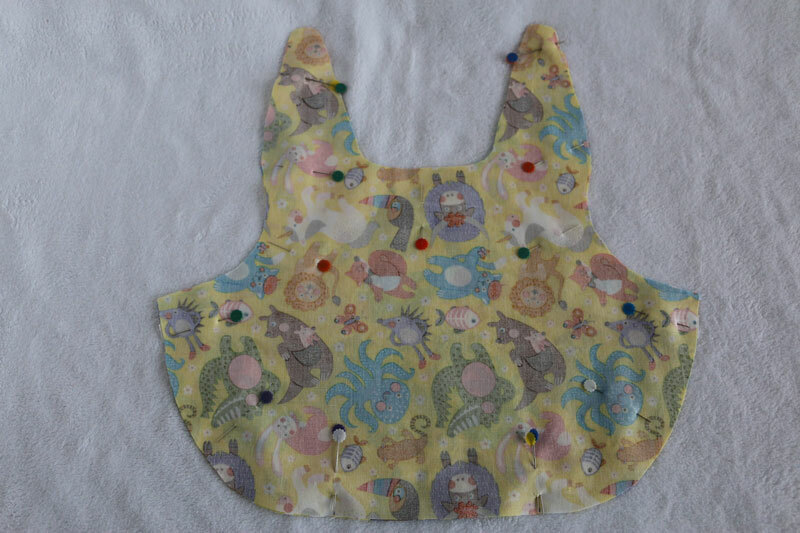 Pin around the rest of the bib to secure pieces together. 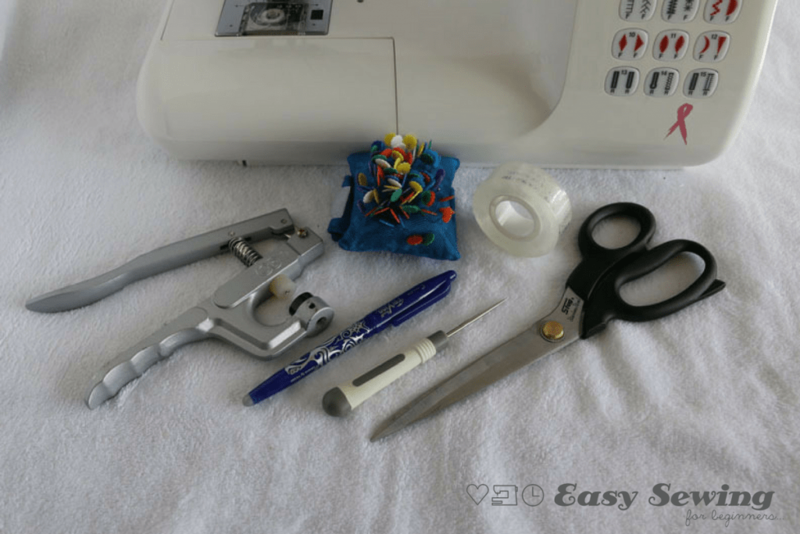 Use 2 pins at the ‘Leave Open’ marks to remind you to stop and backstitch at each end of the openings. 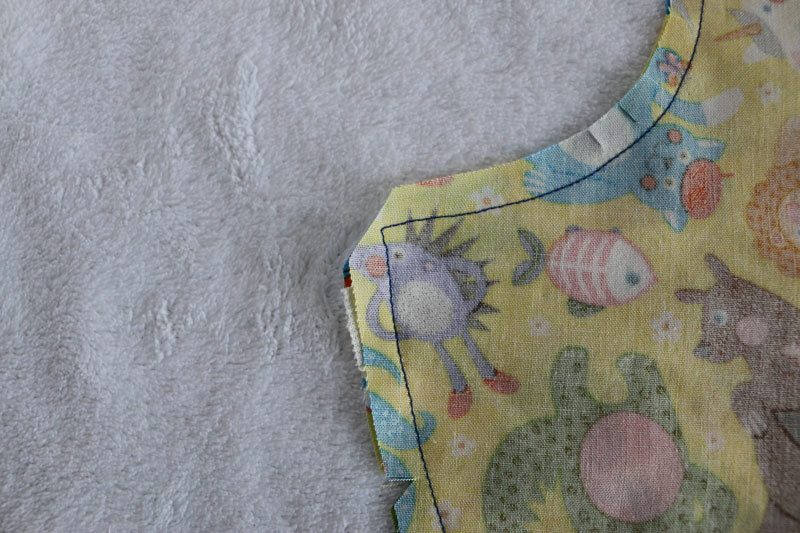 Sew around the outside of the bib, leaving a 1cm/3/8” seam allowance all the way around. Don’t Forget the three openings that you must leave open. Be sure to backstitch at each side of the openings to stop the threads from unraveling when turning right side out. 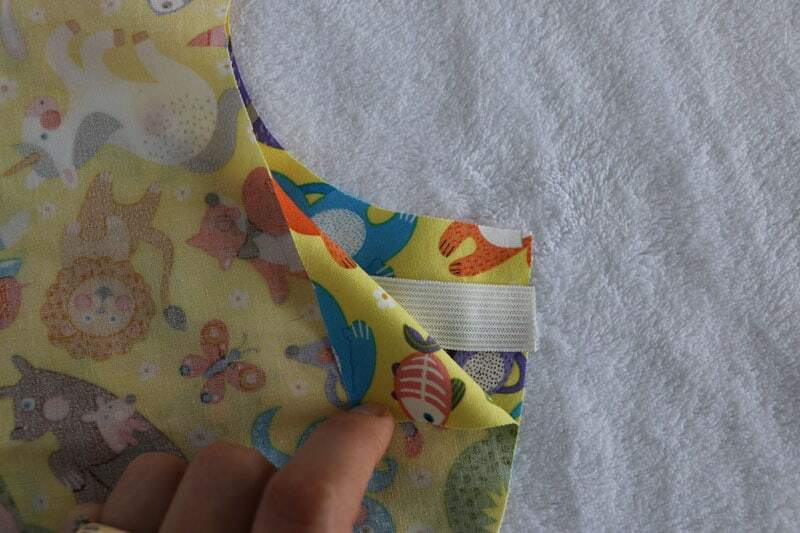 Trim down to about 3mm/1/8”at the 2 top points of the bib and at the corners near the elastic. 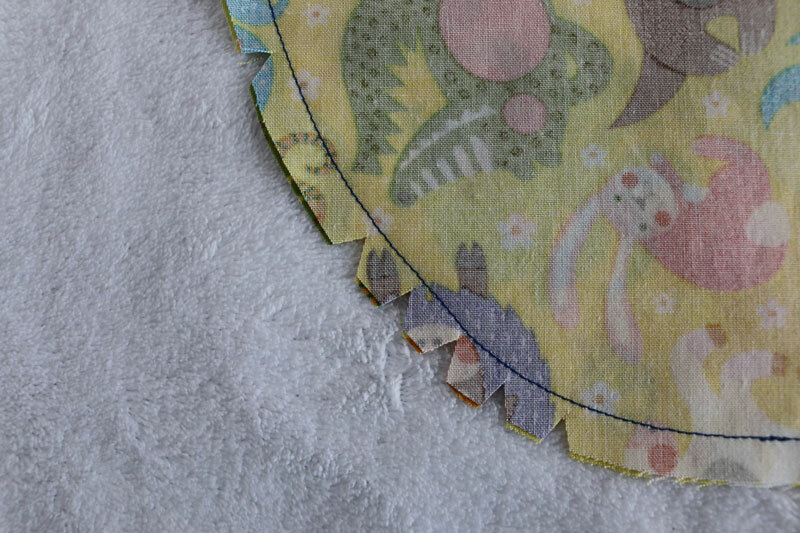 Cut small triangles from the seam allowance (1cm/3/8” apart) on the outward curves to reduce the bulk in the seam once turned. cut small slits in the seam allowance (1cm/3/8” apart) on the inward curves to allow the seams to sit flat and smooth. 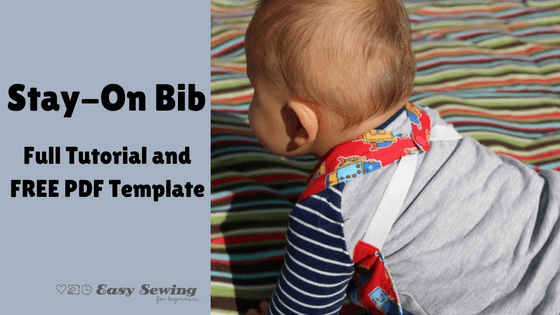 Turn the bib right side out through the large opening at the bottom of the bib. 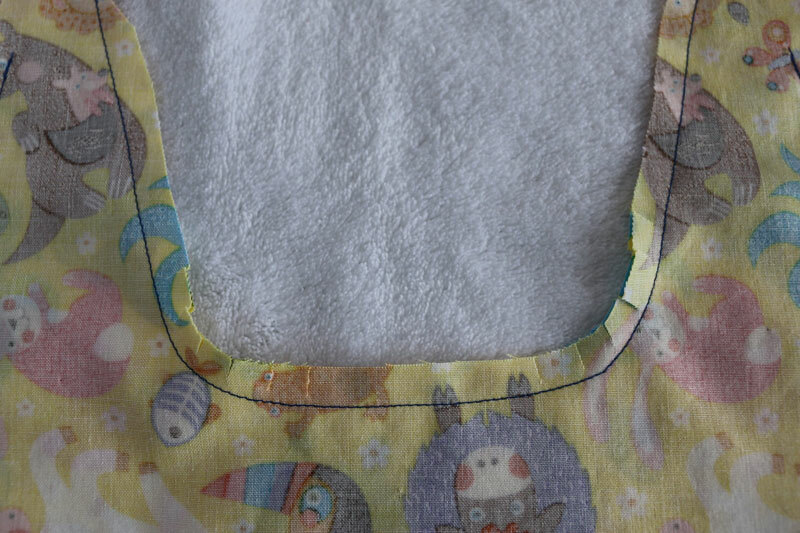 Tip: You could use a chopstick or blunt pencil to help push out the seams, the top points of the bib and the corners. Just be sure not to push all the way through the seam at the top points, as you won’t have much seam allowance left. 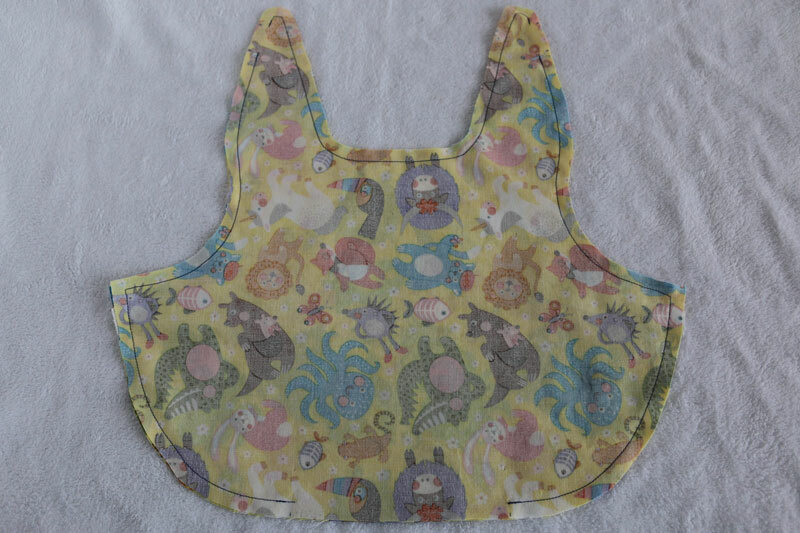 Press the bib flat with an iron. 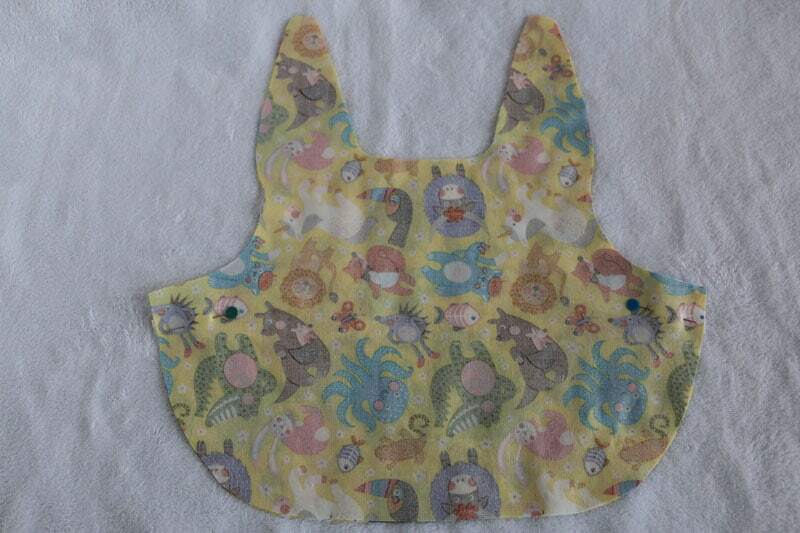 Insert the short end of one of the elastic strips 1cm/3/8” into the small opening at the top of the bib. 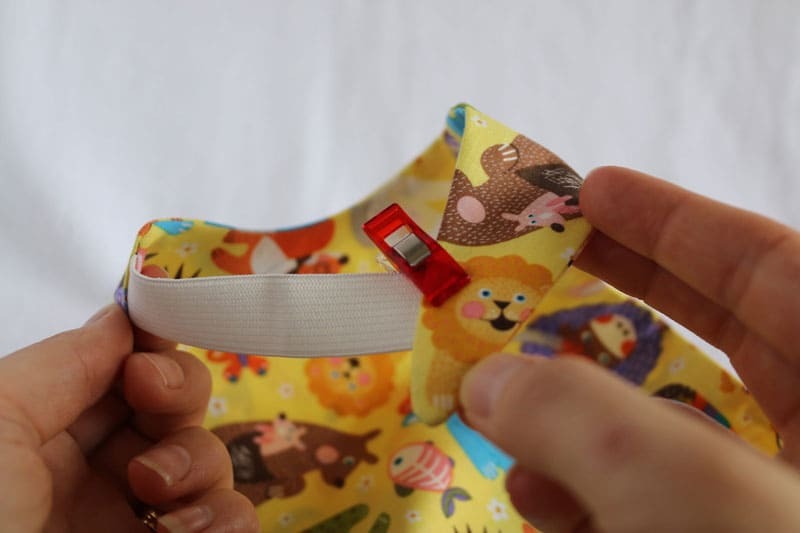 Secure with a pin or clip in place to ensure the elastic doesn’t move. 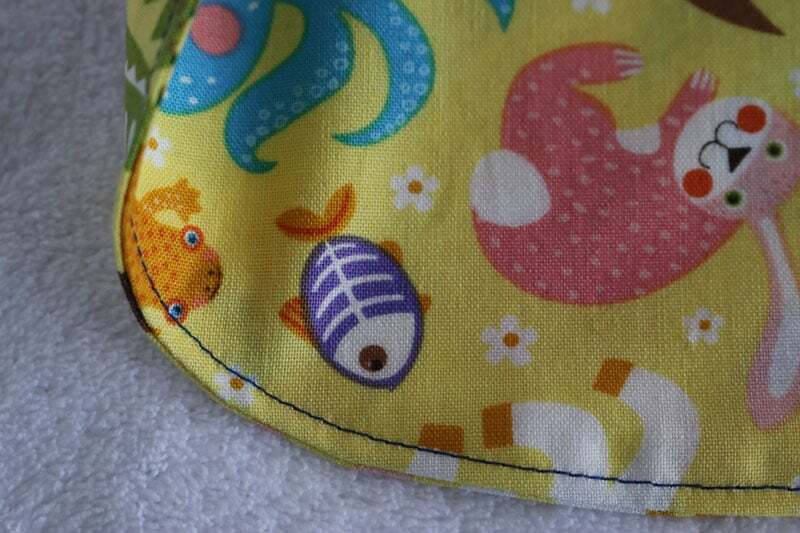 Topstitch around the bib, approximately 3mm/1/8” in from the edge. 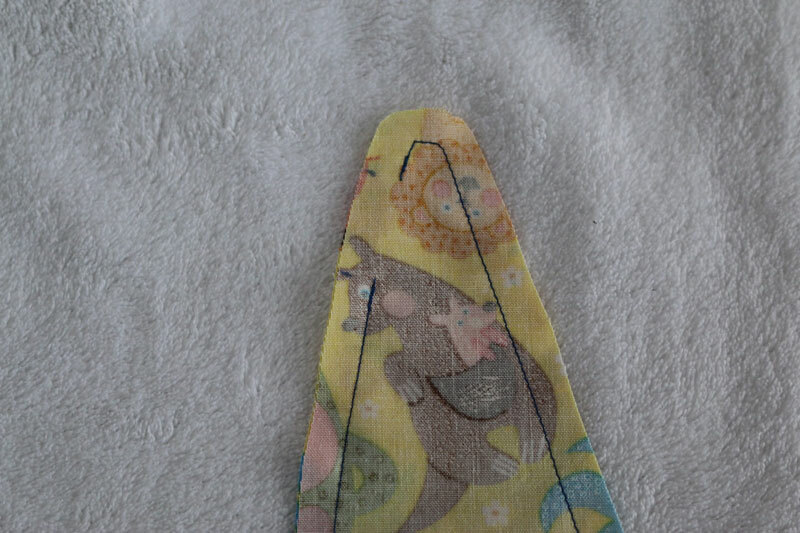 Tip: I like to backstitch over the elastic, where it is inserted into the opening, for extra strength. Be careful topstitching around the top points, as there is not much fabric there for the feed dogs to grab on to. A walking foot comes in handy here. 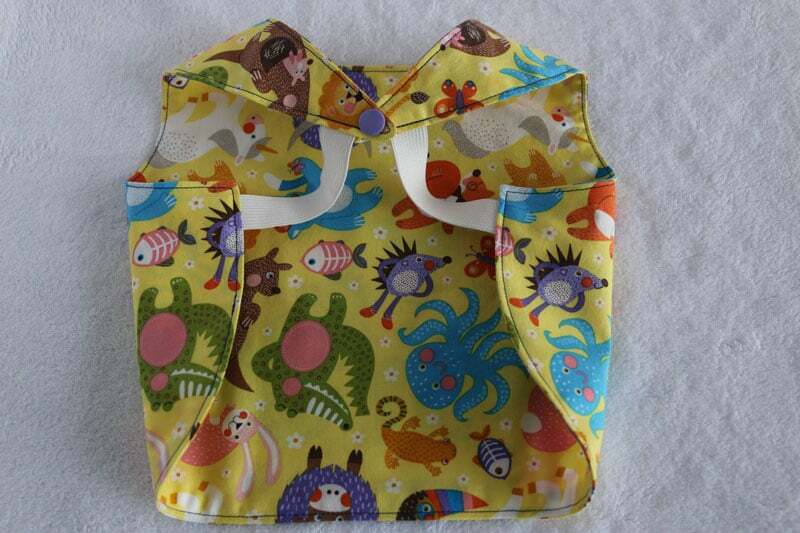 Attach the snaps to the top points of the bib to allow it to be secured around the neck easily. 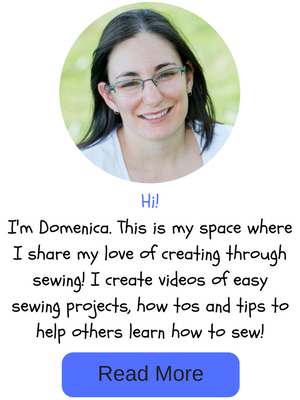 Tip: See my video tutorial for how to use snap pliers if you’re unsure of how to use them. 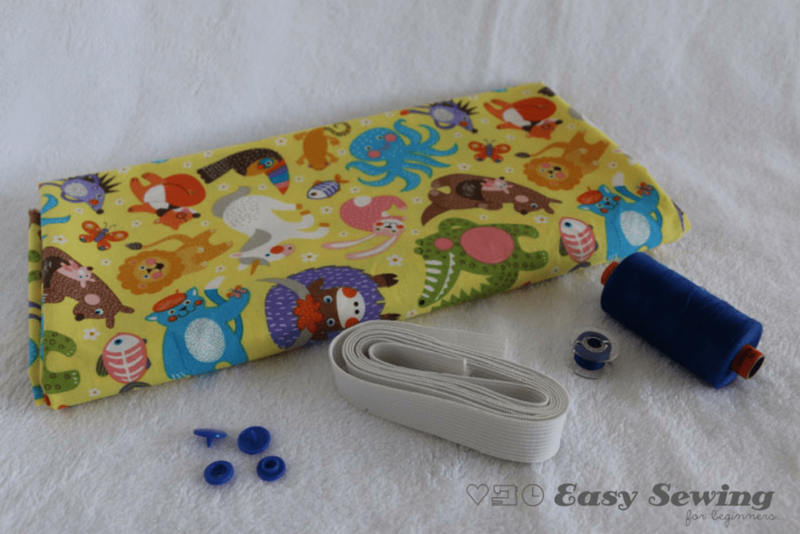 Alternatively, you can use sew on hook and loop tape (velcro), but I find the snaps to be more secure and longer lasting. 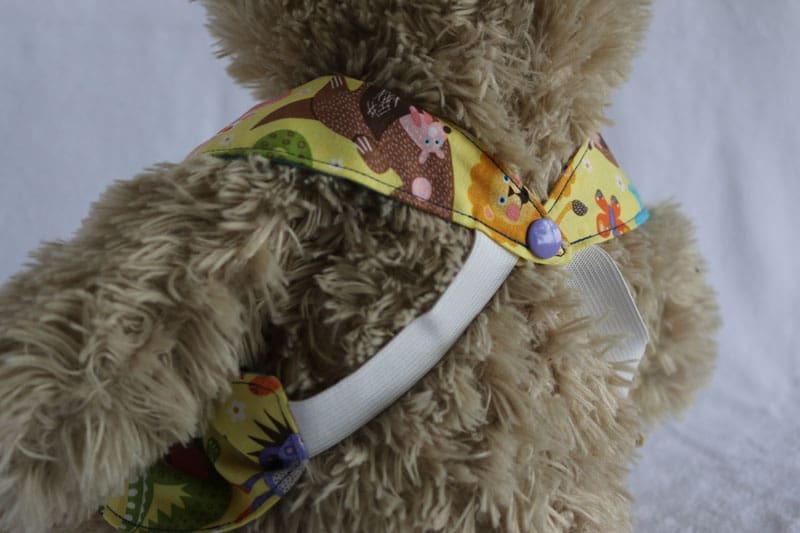 Here’s teddy demonstrating the back of the Stay-On Bib! 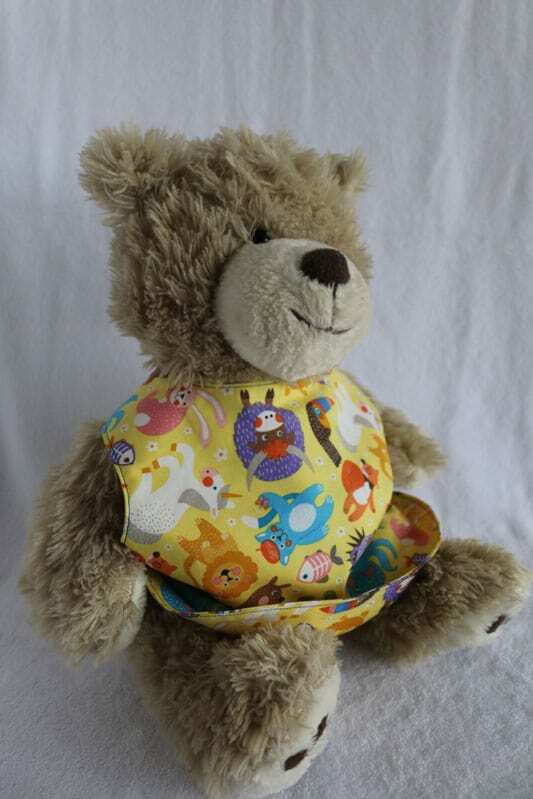 and here’s teddy demonstrating the front of the bib! Love your pattern! I intend to make some for a friends baby! Thanks! Am going to attempt this for my new grandaughter due 12/1/16 . 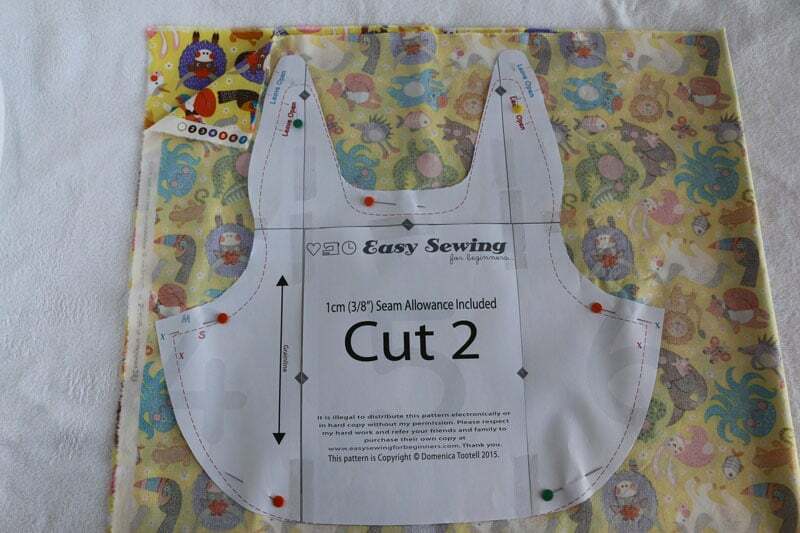 New at sewing, will be looking forward to what I hope is more simple patterns. Thanks B? In the video, it refers to a chart which would tell us how long the elastic is supposed to be. I have gone in circles looking for this chart of information on how long the elastic should be for the free sized Medium. Can anyone tell me where to find it? Sorry about that, Diane. The chart is on the full PDF instructions and I originally made the video for the full version. 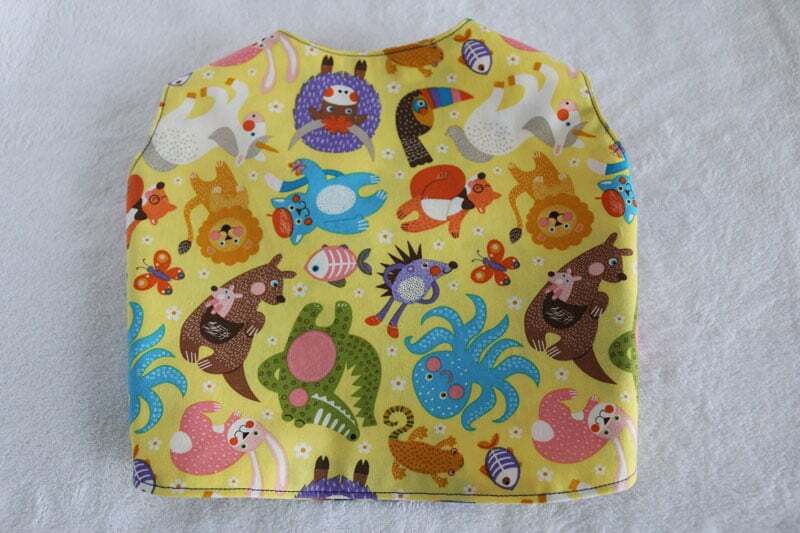 You’ll need 2 x 11 1/2cm or 4 1/2 ” lengths for the medium size stay-on bib. I have now added this to the materials list on the instructions on the page here. Thank you so much for the easy pattern and instructions! 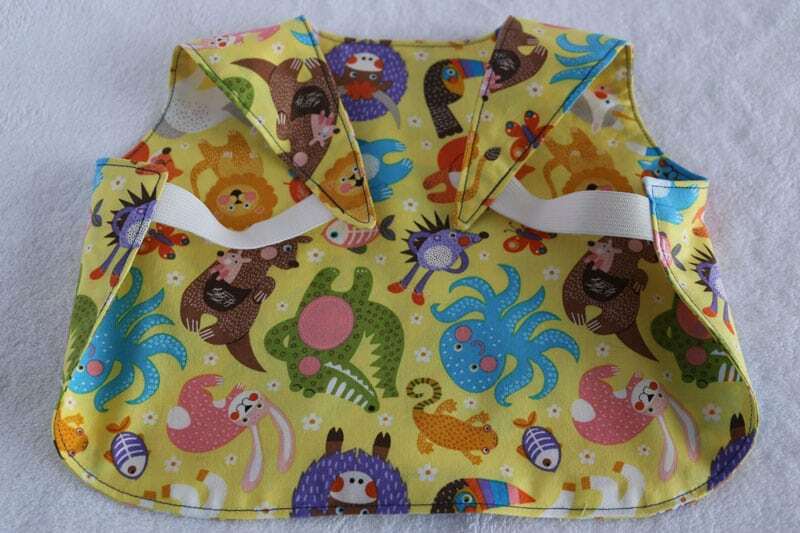 I am making some bibs by recycling some of my daughter’s many many many receiving blankets. This is a perfect use for them. Excellent. What a great way to upcycle!